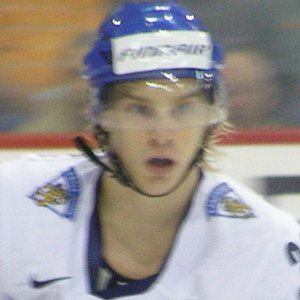 Finnish international winger who spent parts of the 2007-2008 and 2008-2009 season with the NHL's Nashville Predators. He won a bronze medal with his country at the 2014 Olympic Games. He started his professional career in 2003 with the Espoo Blues of the SM-liiga. He signed with the Predators in 2007 and played most of that season with the Milwaukee Admirals. He won a gold medal at the 2011 World Championships and has also played in the Kontinental Hockey League with Salavat Yulaev Ufa. He married Tiia Pihlstrom in 2008 and has a child. He and Jussi Jokinen have played together on Finland's national team.